Maximise your available storage space with this handy pack of 3 underbed storage boxes with lids from Wham. The boxes have a 32 litre capacity, a polypropylene and a blue tinted finsh. 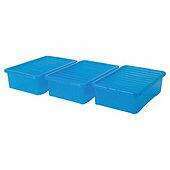 One of the wide, multi-use Wham range of plastic boxes, this convenient Wham Crystal 32L underbed storage box with lid comes in 3-pack form, in blue; 2 other colours are available. Designed to be a solution for storage space issues in the home, it is robust and discreet in tucking away loads safely out of sight. I ordered some of these for in store pickup - one in three were either cracked or had bits broken off. I very much doubt that they are polypropylene as that material tends to deform and not simply snap*. It was the same for the other "Wham Crystal" crates in the order, at least one of each was damaged. Luckily I opened the cardboard boxes in which they were shipped and examined them before accepting and signing for them. I did write to Tesco and query whether these Wham Crystal containers were actually made of polypropylene, weeks ago - no reply. *I don't think that polypropylene can be used to produce transparent (ie clear) injection mouldings, either.